What are UVB percentages and what do they tell us? 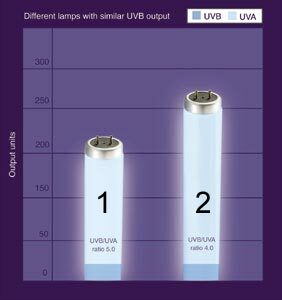 UVB% has developed as a way for some manufacturers to rate, or characterize, sunlamps. Actually this is not "what % of the lamp's output is in the UVB spectrum", but is the ratio of UVB to UVA. If the lamp delivers 10 parts UVB and 200 parts UVA, the UVB ratio (10/200) is 5%. The amount of both UVB and UVA are absolute values, while the ratio is derived. The tanning effect has to do with the amount of specific wavelengths delivered to the skin, and not the ratio of one component to another. Two sunlamps are shown in the simple graph below. Both deliver the same amount of UVB, but deliver greatly differing amounts of UVA. The lamp on the left (1) has a 5% UVB ratio versus that on the right (2) with only 4%. If one only looks to the UVB% values, lamp 1 with its higher UVB/UVA ratio could mistakenly be construed as a stronger or more effective lamp. Not true; lamp 2 has a lower UVB ratio because it delivers so much more UVA. This is only an example and the lamps are real products on the market. Even more importantly, the specific wavelengths (from 280 to 400 nanometers) determine the lamp's effectiveness in producing erythema and melanogenesis, and its effectiveness at stimulating immediate pigmentation and persistent pigment darkening. Generally speaking, the only solid information you get by referring to a manufacturer's UVB% ratings alone is what he/she wants to tell you about their lamp: The higher the stated UVB%, the faster the lamp is supposed to take a tanner to the maximum allowable dose of 4 MEDs for a full tanning session when compared to other lamps from the same manufacturer.